Tan Son Nhat International Airport is the largest airport in Vietnam. This international airport is located about 6 km from Ho Chi Minh City downtown or District 1 is most likely where you choose cheap accommodation. Tan Son Nhat Airport has two terminals, domestic terminal which is the old terminal, and a new international terminal which is start functioned in 2007. 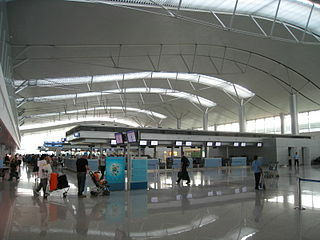 When tourists arrive at the international airport and will continue with domestic flights, travelers should be heading to the domestic terminal within 200 meters. Tan Son Nhat Airport serves a wide range of domestic routes, including from Hanoi and Da Dang, National Airlines, Vietnam Air serves domestic and international routes. Meanwhile, for international routes, the airport serves a variety of international airlines such as Istanbul, Sydney, London, Kuala Lumpur, Beijing, Busan, Tokyo, Manila, Siem Reap, Perth, Melbourne, Paris, Singapore, Shanghai, Osaka, Jakarta, Phnom Penh , and Seoul. Of course there are alternatives other flights with different airlines and flight route. However, the direct flight, tickets are usually cheaper than transit flight. Tourist first impression when arriving at Tan Son Nhat International Terminal is a condition that the airport is clean, new, and modern. In addition, immigration at airport protocol is very sleek and uncomplicated. Travelers simply fill out the immigration card is usually given on the plane and stay in line. Residents of Southeast Asian Nations doesn’t require a visa to enter this country. From outside ASEAN, you also get tan son nhat airport visa on arrival. The most inexpensive way to and from Tan Son Nhat airport is to use the public bus No. 152. This cheap transportation is very convenient for tourists, especially going to the Pham Ngu Lao, District 1. The rate charged for one person is 4000 Dong and additional 4000 Dong again if travelers carrying large bags or suitcases. Bus No. 152 will take you from the airport to the east side of the Pham Ngu Lao or at the bus terminal near Ben Thanh Market roundabout. From the international terminal, you just turn right and usually there is already a bus waiting. If not, try to get to the domestic terminal.In front of the domestic terminal, the bus will be waiting across the small street, but there is no bus stop signage. It’s good for the tourists bring little fraction money to pay the costs, if you wont to change the form of coins with a very small fraction. Bus No. 152 only operates until 18:00 so that when the night arrived, tourists should look for other alternatives. if you arrive before 18.00, ignore the taxi driver who said that the bus is no longer in operation. They just want you to ride their cab. This section will be longer because of the taxi problem in Vietnam, especially in Ho Chi Minh City is a delicate subject for foreigners who visit. Many tourists who had bad experiences with Vietnam taxi. However, a bad experience like what you experienced with the Vietnam cab, not to ruin your entire vacation. Here are some tips that will help you avoid a bad experience that will does not happen. At first the airport authority seeks a monopoly by teaming up with some specific taxi company. Only certain taxis can enter the arrival area. But, of course, still stealing looking for another taxi passenger who had just arrived. When the new international terminal opened, only the Saigon Airport Taxi cab company that has a full monopoly. They also set a fixed rate, is three times more expensive than the cost of the meter. However, this system ultimately getting disappear within a year, and now almost all the major taxi companies can pick up passengers. Please attention that you must still pay the fee surcharge of 10000 Dong. When arriving at the ground floor of the international arrivals terminal, you can go up two floors to the departure to find a Vinasun taxi at the right end of the terminal. Another option is, you get out of the international terminal to the domestic terminal. The cost from the airport to the city center as the District 1 Dong Khoi and including Pham Ngu Lao, the normal metered taxis around 100000 Dong plus 10000 dong surcharge. So travelers must spend a total of approximately 110000 Dong. At the domestic terminal there is also a taxi company called Sasco taxi which is only allowed to take passenger in a right side of the airport building. Of course the cost of using more expensive than a taxi Sasco that are lined up about 100 yards away, near the parking lot. Usually aka tone approaching the travelers to offer a taxi. Actually the taxi fare in Ho Chi Minh City is quite reasonable if you get a taxi baugs. Experienced travelers are usually always use the services of a taxi company that is reliable as Mai Linh and Vinasun. Both of these taxi companies in general good, but of course it was likely there rogue driver who wants to get greater profits. Make sure the meter runs automatically after the taxi moved 5 meters. When in doubt, it’s good before you ride make sure first that the costs will be paid by the meter, not the bargaining price. Travelers should be very careful in choosing a taxi because foreign tourists are usually most often get the target of scams. Sometimes, there are people who without being asked to help you insert items into the trunk. They will ask a lot of money. There also will be trying to steal your luggage. A driver who may be running a dishonest taxi without turning on the meter. They will try to negotiate bargaining prices in a quiet place, or in locations where it is difficult for you to go out and find another taxi. If the traffic is not too crowded at night to early morning, the distance to the city center is only about 15 minutes. However, on a normal day, it took about an hour to reach the city center. Taxi fare from the airport to the city center range 5000 to 140000 Dong depends on traffic density. In general, travelers should remain vigilant in choosing a taxi in Ho Chi Minh City. When you see the local people do not want using a particular taxi company, then avoid. Better waiting longer than sorry later. Find uniformed officers taxi. Mai Linh taxi officer using a green shirt with a green tie anyway, while taxis officer from Vinasun using dark green shirt with a maroon tie. They will find a taxi for you. One other alternative is to buy a taxi coupon at the counter after the immigration clearance at the international terminal. Travellers should also be alert to the cab of the recommended companies. When you’ve waved to stop the taxi, it was only just the same color, not the company desired. In Vietnam, many colors mimic a rogue taxi cab company name even larger. For example, Vinasum or Vinason instead Vinasun, or May Linh or Mai Lin instead Mai Linh. Taxi like this will attract a very expensive cost from you. There are also many instances when the taxi driver made off with passenger luggage. There are also taxi cab phone numbers even imitate large corporations. Taxi Vinamet for example, even a telephone number so that passengers taxi Vinasun fooled. Do not ever use this type of taxi. in addition, be careful with the taxi touts who wore a white shirt and holding a placard with a specific price. They will lower the rate by half, but it is also still a robbery. Rates should not be that expensive. Ignore them, and yet choose to metered taxis from reputable companies. When the taxi meter will go up, it helps you carry small denominations. Exchange rate in money exchange at the airport is usually not very good, you can still redeem at least around $ 10 for cab fare. Other types of fraud are the taxi drivers will take you to a particular hotel because they will get a commission. You should clearly say your destination. Say that you have booked the hotel even though it may actually not. Do not believe when the taxi driver said that the hotel will be fully booked or already closed, even saying just burned out. When heading to the airport, you have to say with a specific terminal to be addressed. International flights depart from the new terminal. Meanwhile domestic flight departing from the old terminal. when delivered to the wrong terminal, you have to hurry to walk toward the destination terminal as far as 600 meters. Of course this is better avoided, especially if you’ve been late for check-in or carry a lot of luggage. When entering the airport, taxi drivers will add the entry fee of 5000 Dong. From Ben Thanh Market to the airport at noon, the total amount paid around 100000 Dong Mai Linh or Vinasun use. Business car rental with full driver increasingly widespread. Perhaps the business is growing because a lot of bad experiences with taxi in Ho Chi Minh City. They even have a driver who can speak English. The car is also good. The trip from the airport to the city center will be withdrawn fare 140000 Dong. Some reliable companies such as Saigon Tourist, SATSCO, and Vietnam Transfer Service. Reservation counter is located at the arrival terminal of Tan Son Nhat airport.